It's amazing how many people start canopy shopping thinking something like, 'Well, they're all mostly the same - I'll probably just look for a decent tent as cheaply as I can get it'. When canopy shoppers see this Vitabri V3 10 x 10 Aluminum Pop Up Waterproof Canopy, however, that kind of thinking quickly fades away. It isn't because this canopy has reinvented the wheel, though. People are amazed because, for the same money you'd spend on 'any old' shelter, you can get this waterproof pop up canopy that features vastly superior construction, engineering, convenience, and durability. Check out a few of the features to see this advanced design for yourself. Here are a few structural highlights. First of all, the pop up design of this canopy takes seconds to set up and take down, plus you never have to remove the top. Once in place, you can take advantage of the telescoping aluminum legs with three available height settings, the reinforced cross-bar roof system that offers all kinds of stability, or the incredibly light, incredibly strong polypropylene junctions strengthened with fiberglass. Or you could check out the stainless steel fasteners, or the cast aluminum feet. It's your choice. You can't forget about the canopy's top, though. This top is made of heavy-duty 1000 Denier vinyl that is as strong and durable as you'll find in any shelter. It is waterproof, mind you, not water-resistant like many competitors, so you, your guests, and your stuff will be safe and protected. The top features self-locking straps that keep roof tension perfect at all times, the corners are reinforced to prevent damage from friction, and there's even a Velcro strip to make sidewall addition (sidewalls must be purchased separately) simple if you choose to add them at any time. To put is simply, there just isn't another product like this out there. It's easy to set up, easy to maintain, and deadly effective in pretty much every outdoor situation you could dream up. When you combine those factors with a price that's comparable to many lesser models on the market, it's no surprise that more and more people are looking to the Vitabri V3 10 x 10 Aluminum Pop Up Waterproof Canopy to meet their personal and professional outdoor needs. As a result of having the big benefit of a waterproof roof and sides (separate purchase of course but made from same material as the roof), how much light is lost compared to a non waterproof roof? I'd imagine the vinyl material would have an impact here. Please advise. If I had no windows or door and all sides on in the middle of the day, is it dull inside? Thank you. The sidewall does minimize sunlight on days the sun is really oppressive, but I do not believe that it will totally block out sunlight. 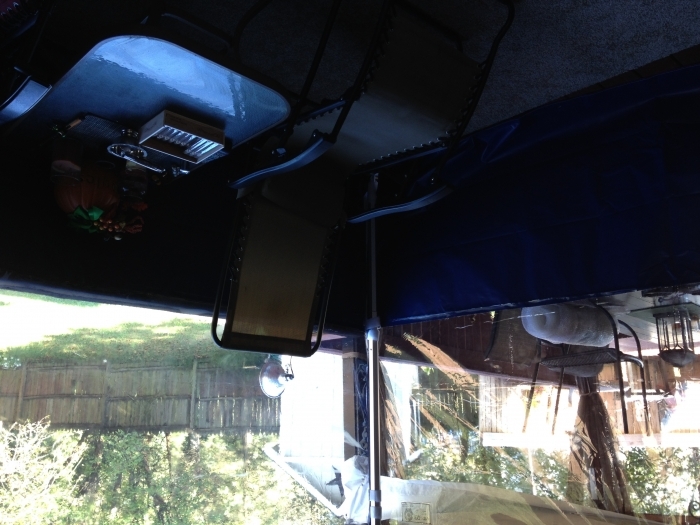 There is a picture showing what the canopy looks like with the sidewalls up and a canopy with window sidewalls here. Can we get this canopy custom made with our logo on it? Is there a warranty on this canopy? If so, how long is it for? Vitabri has a 2 year manufacturers warranty on their products. How well would this canopy stand up in the wind? We live in Oregon and we want to keep this up all winter for rain protection on our back patio. Would this hold up to an occasional wind storm? The canopy can withstand some wind but, like all pop up canopies, it is designed to be used short term only. It is not designed to be left up unattended and not designed to withstand storms. You would need to look for something that is designed to be more permanent. I have had a few different tents in the past and by far this is the sterdious. I have had it out in a pop up thunderstorm I watched as other tents were shaking and lifting where this tent just stood there. I do anchor it down and have had no problem at all!! Also it was dry inside!! The Vitabri V3 looks like it will be good for extreme corrosion resistance. I just cannot see the securing devices for the leg extensions. What materials are used? Carbon steel? Plastic? All of the metal parts are made of aluminum. Some of the fittings will have plastic parts. This canopy does not come with any sidewalls, correct? Yes, that is correct. The side walls can be purchased separately if desired and can be found on the accessories tab on the item page. This canopy doesn't come with side walls. But I did find that it is sturdier then the other ones I have used. I had it up in a thunderstorm at a show and this one was the only one that wasn't even shaking. Also not a drop of water was in my tent! Does the Vitabri V3 aluminum pop up canopy come with sides? It does not come with sides but they are available for separate purchase on the accessories tab on the item page. Can I leave the canopy on when I take it down or do I have to remove it and reinstall each time I use it? Can I collapse the tent for storage with the canopy in place? 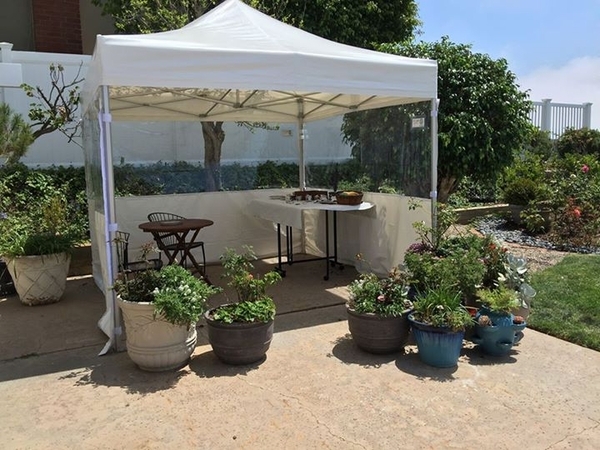 Yes, the manufacturer does market this canopy as capable of doing just that - "Revolutionary quick setup concept makes setup and take-down simple without having to remove the roof." I'm looking for a waterproof top for my existing frame of a Caravan Canopy. I not only want the roof waterproof, but want it to not collect rainwater in the rain. I cannot swing $1000 for a pop up unless it's also printed and customized at that price. What can I get? Unfortunately, Caravan only offers tops that are water-resistant and not water-proof. One way to lessen the collection of rain on your top is to put the center peak pole at its highest setting. This will stretch the fabric more, and reduce some of the pooling. 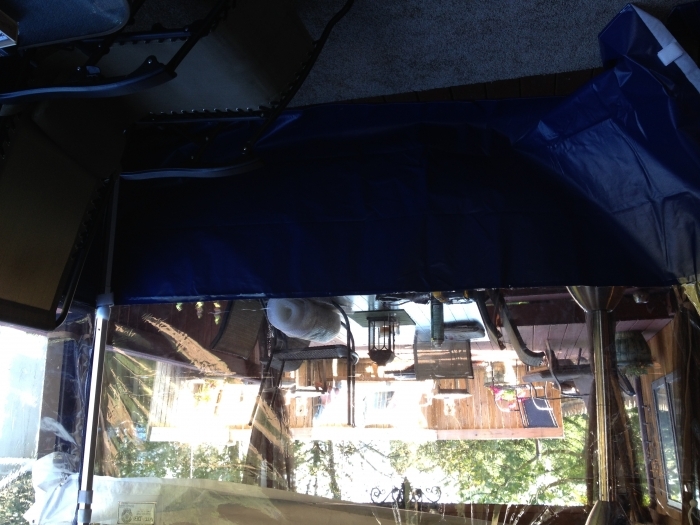 However, the manufacturer does recommend that your canopy be taken down during high winds and inclement weather. Other than that, the only water-proof tent we have is the Vitabri V3 10X10. Is the top one seamless piece of vinyl? I have had trouble in the past with leaking seams with my canopy tops. You will not have to worry about rain as this canopy top is 100% waterproof. The show I am applying to strongly suggests a tent with wind vents. Are they all that helpful? Is this a possibility with this model? Are there mesh sidewalls available for Vitabri V3 canopies? Yes, we can get half mesh and half solid walls for the V3. Will this canopy pool water on the top ? No, it will not. The top features self-locking straps that keep roof tension perfect at all times. I need a canopy that I can put up by myself. I am five foot tall. And in my mid 60's but am in good shape for my age. I know that if you have two people it will go up easier and faster but I don't have that option. Can one person my size put up this canopy with the side walls within an hour or less. Or how long would it take if it is possible? I know that question is relative but need some idea before I purchase this. I already have a very nice canopy which I will sell as I can't put it up by myself. My help quit on me and I have no one else to help. It weights 66 pounds so it will depend if you can handle that much weight on your own. If you can, it should take only about 10 minutes. There is a video on the item page just under the picture that will show you how it is put up. How tall is the inside of this tent? The headroom or valence height of this canopy is 82"
Does Vitabri make a waterproof wall with a center zipper for the Vitabri V3 10x10? You would be interested in the Vitabri 10 Foot Vinyl Canopy Side Wall. Simply choose "Door" under the Choose Wall Options menu. What's your smallest dimensions (10'x10'7') canopy when collapsed? I'm looking for up to 6' in length when collapsed to stash away properly. The collapsed dimensions are The dimensions when collapsed are 13’x13’’x60’’ so this will fit your requirements. However, if you're looking for an alternative, there is The Caravan Canopy Traveler. It folds down to only a 4'3" height. Do you sell any less expensive pop-ups with a waterproof top? This is the least expensive 10' x 10' popup with a waterproof top. I am searching for a durable canopy with unbreakable frames that can last long for a special purpose. This tent can be easily detached when the need arises and also fixed easily. I found one name - VITABRI V3 10 BY 10 ALUMINIUM POP UP CANOPY WATERPROOF TOP. I am not sure if this canopy can last long under severe weather conditions (snow, rain, scorching temperature). I need your feedback. Being that this is the only waterproof popup style canopy that we offer, the Vitabri V3 is extremely resilient to the elements. Unlike most popup style canopies, where the roof needs to be removed before storage, the Vitabri V3 can be stored with the top still attached to its frame. The aluminum frame will not rust or corrode, while the junction parts are constructed from both fiberglass and polypropylene. Replacement parts are readily available directly from the manufacturer, located in California. Does this model come with a carry bag? What are the dimensions of this model fully collapsed? It does not come with a bag. That would be a separate purchase. The dimensions when collapsed are 13’x13’’x60’’. Excellent Quality Canopy and worth every penny! I love the quality of Vitabri and because I expect this canopy to last far longer then the cheaper versions the value on the return (of investment) is actually much better! Also note that this is an actual WATERPROOF canopy not just "water resistant" ... so things stay dry and the top does not stretch or pocket like cheaper ones do! !!! A little hard to set up..hopefully will get easier. this is a good waterproof canopy,one person can set it up. the construction of the frame won't collect rain water. the sides are easy to attach and close with the velcro. also the sides will cut down the wind. Pros100% waterproof. one person set up. Conscan't buy a replacement top separate. everything is sold separate. the bag for protection and storage is impossible for one person and difficult for two people to put on. Canopy is heavy and would be nice if they made a bag with wheels on so moving it would n be easier.